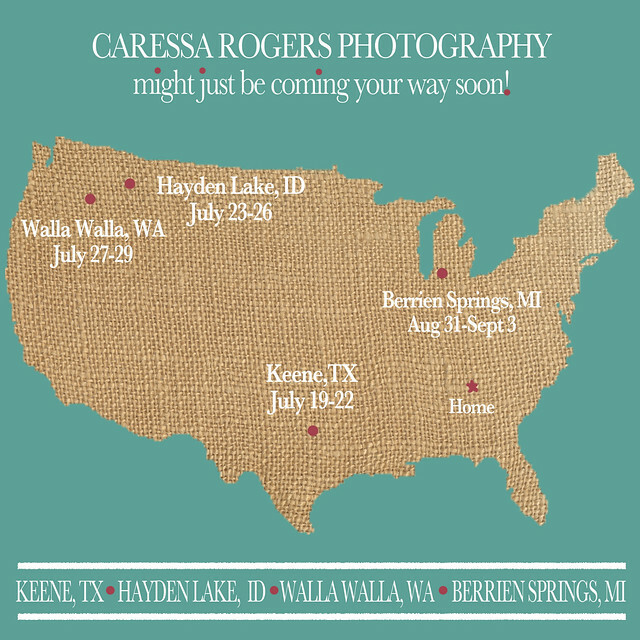 Caressa Rogers Photography: Texas, Idaho, Washington, and Michagan... I'm coming your way! Texas, Idaho, Washington, and Michagan... I'm coming your way! Pin It Off and on for the next two months I'm going to be making stops around the country for photo shoots! Just wanted to share my schedule for those interested in a session that might be around Keene, TX | Hayden Lake, ID | Walla Walla, WA | Berrien Springs, MI. I have a session or two left for most of the cities. Check the schedule below and hop on over to Caressa Rogers Photography Website to book your session! Hope to see some of you all soon! This is sooo cute and such a creative idea!! !